As an integrated hub of the NIH Clinical and Translational Science Awards (CTSA) Program, the North Carolina Translational and Clinical Sciences (NC TraCS) Institute combines the research strengths, resources and opportunities of the University of North Carolina at Chapel Hill campus and partner institutions NC State University in Raleigh, North Carolina A&T State University in Greensboro, and RTI International in the Research Triangle Park. 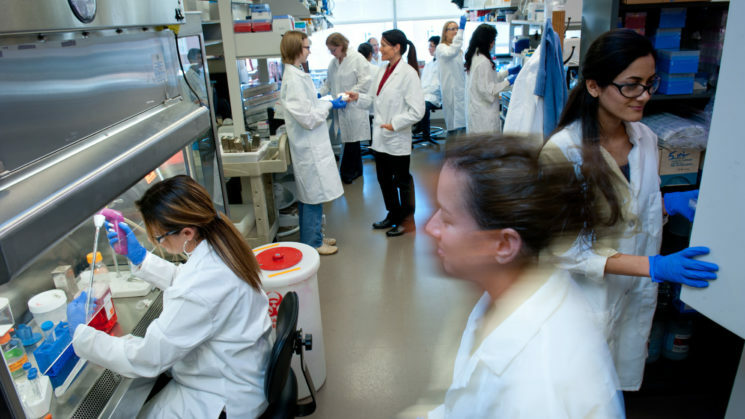 Strategically designed to overcome barriers historically responsible for fragmenting and delaying research efforts, the NC TraCS Institute offers targeted, comprehensive and interdisciplinary solutions to investigators in the area of clinical and translational science. The NC TraCS Institute seeks to help advance the work of those making direct impacts on health practices in research labs, clinical settings, homes, and communities — by serving as a centralized portal through which research personnel can gain access to valuable resources and services. Each year, a number of these pilot grants specifically require at least one principal investigator (PI) from NC State and one from UNC-Chapel Hill to be involved in the project. To see the real-life opportunities and benefits these pilot grants create, read about the following three projects — one that’s concluded, one that’s in progress, and one that’s yet to begin — and hear the perspectives of an NC State PI from each of them. Slightly over a decade ago, Marian McCord, who then had a joint appointment at NC State in Textile Engineering, Chemistry and Science and in UNC-Chapel Hill and NC State’s Joint Biomedical Engineering Department, met Melanie Joy, then an associate professor in UNC-Chapel Hill’s School of Medicine and School of Pharmacy. Soon after, they teamed up on this project, which aimed to develop — and ultimately commercialize — a filtration device designed to maximize the amount of excess phosphates removed from blood during dialysis, thereby increasing the life expectancy of end-stage kidney disease patients. A $50K NC TraCS Pilot Grant led to them earning a wealth of additional funding — including nearly $340,000 from the Wallace H. Coulter Foundation — and forming Katharos, a start-up company featured in NC State’s Fast 15, in Spring 2012. She added that the NC TraCS Institute also provides a number of its own resources, such as mentoring services focused on commercialization and other aspects beyond the research itself. For instance, there were experts available to help determine whether she and Joy’s device would be eligible for cost-reimbursement through Medicare, McCord said. McCord is “thrilled” NC State University is now a full partner in the NC TraCS Institute and “highly recommends” the Pilot Grant Program to others. Yong Zhu, a professor in NC State’s Mechanical and Aerospace Engineering Department, and Xiaogang Hu, an assistant professor in UNC-CH and NC State’s Joint Biomedical Engineering Department, are working together on this project, which aims to develop a prototype for a glove with an integrated sensor used to track the hand movements of stroke survivors. The data collected about the patients’ hand movements will allow doctors to more effectively track their patients’ recovery progress and, hopefully, provide improved treatment and rehabilitation options. But the integrated-sensor technology also has an array of additional applications for tracking human motions, such as sports applications, Zhu said, and this initial project is hopefully just the beginning. Zhu credits the NC TraCS Institute’s Pilot Program for the help it has provided to ensure the most successful outcomes possible, primarily in the form of its mentoring services. There is still much work to be done, as the project just got rolling in spring 2018, but Zhu said he and Hu have already been engaged with some of the available resources offered by NC TraCS. Zhu looks forward to what this project will bring — and he also is excited about what continued engagement with the NC TraCS Institute can bring, as he’d like to see increased and continued collaboration between researchers from UNC-Chapel Hill and NC State. “Collaboration between Carolina and NC State — between engineering and healthcare — is very important,” Zhu said. Zhu wants more researchers in healthcare to be aware of the tools and technology available to them via their counterparts in engineering research. And conversely, he wants more engineers to be aware of the problems faced in healthcare-related research that could potentially be solved with the help of these tools. The NC TraCS Institute is doing its part to help bridge this gap. Michael Kosorok, Eric Laber, Beth Mayer-Davis and Dr. Laura Young, who specializes in the care of patients with diabetes, were recently awarded funding for this project, which aims to develop a mobile health app for patients with Type 1 diabetes. The app will help these patients “more easily engage in physical activity” by using data it collects about them to “provide personalized strategies before, during and after planned physical activity, to keep blood sugar levels in a normal range,” said Anna Kahkoska, an M.D./Ph.D candidate at UNC-Chapel Hill, co-mentored by Mayer-Davis and Kosorok, whose dissertation focuses on the use of machine learning techniques to identify Type 1 diabetes patients with distinct disease subtypes who might respond better to alternative treatment options. Laber, an associate professor in NC State’s Statistics Department, explained that the statistical expertise will play a heavy role in determining how and when to implement these strategies, such as sending a reminder to take one’s insulin, so as to optimize the app’s effectiveness. Moreover, this particular project “represents a new direction for a transdisciplinary collaboration” in the way it has brought together researchers who specialize in a wide range of disciplines — from nutrition and endocrinology to biostatistics and software engineering. However, this unique collaboration also results in a niche kind of research for which funding can be hard to find through “traditional” sources. That’s where the NC TraCS Pilot Grant Program came in. If you have a project proposal you think is well-suited for one of the opportunities offered by the Pilot Grant Program, take a look at what is currently available. Keep in mind that this is a matching program, which means that, as a full partner, NC State is required to match all funding 1:1. PIs should seek matching funds from their college, department, or center/institute. The next proposal deadline is October 9, 2018.